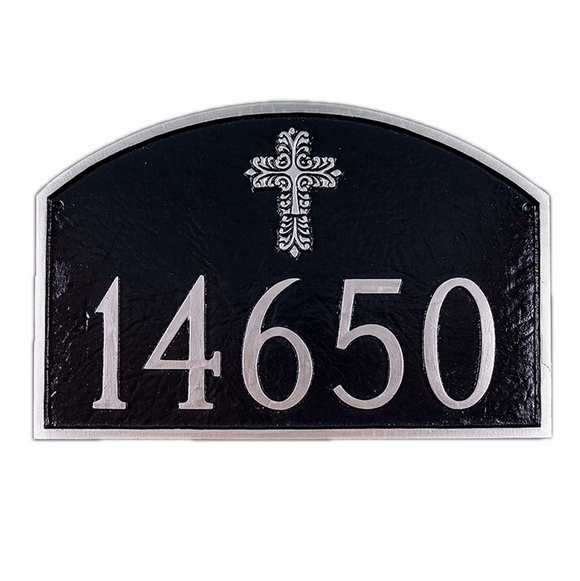 Personalized House Number Sign with Cross - - arch shape address plaque prominently displays a decorative religious cross above the address number. Wall mount. Made in USA. The prestige style (large image) has a full-width arch across the top and is 15.5"W x 10.25"H.
The classic style (small image) has a more defined centered arch is 16.5"W x 10.25"H.
Wall mount religious theme address sign showcases a decorative cross above your house number. House number on sample plaque above: 14650. Made in the USA.